Every musician has at the back of his or her mind the musical equivalent of the "bucket list" (I detest that term)-- pieces one would love to perform or to compose, but hasn't yet found the right collaborators, or venue, or concert for them. I prefer the more attractive term "desiderata." With the extraordinary program this evening we are all checking multiple works off our lists of desiderata. I feel so fortunate that the program, the venue, and the collaborators have come together to perform these monumental works. And while we'll draw big, beautiful, bold checks next to three items on out list, working with Paula and Yuki and being buoyed up by the passion of their music making has only inspired us to add more items to our desiderata. I look forward to making more and more check marks with them. It is so amazing to see what this group has become since we first started in the late 90's. 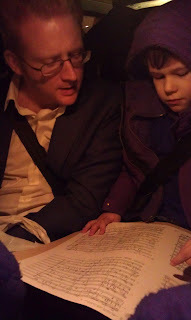 I love that my son Ethan can have a conversation with Steve during a car ride while looking at Nono's score. 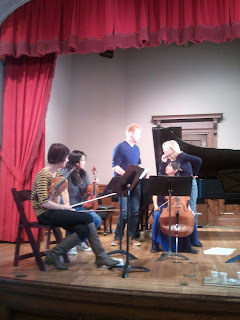 I love that we get a chance to collaborate with great musicians like Paula Robison and Yuki Numata. 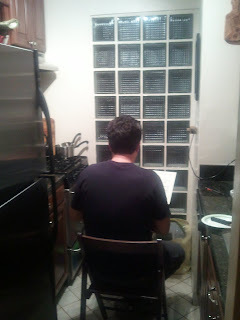 Ben loves that he can practice the Lachenmann at "full-volume" in the kitchen without waking up Ethan. Hope to see you Sunday at 6pm! Paula Robison says the devil made her do it. Cool thing: tracing Schoenberg's musical references to Lucifer, "Miscalled the Morning Star" through the whole work...sometimes only as a scattering of descending pizzicati....almost as a reminderto the fallen or falling Napoleon...., sometimes the scattering and then the ponticello grindingof death, also tossed off as a dark reminder at selected moments....what a genius! Paula Robison on "Ode to Napoleon Buonaparte"
Lord Byron was a powerful swimmer. Whenever the whirlings of his eventful and tumultuous life got a bit too much for him he would dive into the nearest body of water and swim, sometimes for many miles, sometimes through the canals of Venice, often far out to sea. As I've prepared Schoenberg;s "Ode to Napoleon Buonaparte," wondering how in Heaven's name I, a woman, can declaim Byron's words, I have heard first the voice of Schoenberg snarling at me, insisting that it was written for a man's voice and should be done only with a male reciter...and then suddenly the voice of Lord Byron: laughing, shrugging his beautiful shoulders, and saying "Swim, woman, swim! Jump in and swim!" What could I do? I jumped in, and I'm swimming for my life, and I feel like George Gordon, Lord Byron is right there next to me. I hope that the spirit of Schoenberg will relent a bit and say that this was a good thing! Many a woman lost a son or brother to Napoleon; many a woman her husband, or lover, or both. Every day in our war-infested, tyrant-molested world a woman loses a loved one or is lost, herself, in battle. So Byron's powerful words speak very much from our women's hearts and minds, too.I look forward with all my heart and mind to this, my first "Ode to Napoleon", with the amazing players of counter)induction. We will perform "Ode to Napoleon Buonaparte" this coming Sunday. More info here.